By Randy Donowitz I have written articles for the marine aquarium hobby for many years. As we plan this new venture called Reefs Magazine, it occurs to me that much, if not most of my previous writing is no longer readily available to hobbyists. I’d like to think that some of it is still valuable to beginning aquarists while fully acknowledging that things in the world of reef keeping have changed over the past 10 years or so… or have they? In essence this is the question that interests me and thus through my Did I Say That? offerings, I hope to provide a lens backward over the past decade of our hobby and with it, a space for us to consider and discuss what has changed and if these changes are for the better. I could of course re-write and update these articles, but perhaps there is more to be learned from telling it like it was. Or maybe I’m just too lazy!!!!…. Did I say that? The following represents the slightly edited merging of two articles that were first published in Aquarium Frontiers On-line magazine back in 1998.What place does a beginners’ column have in a magazine dedicated to the advanced hobbyist? When Terry Siegel approached me about writing a monthly beginners’ column for Aquarium Frontiers On-Line, I thought for many days about what of value I could bring to the publication and its readership. Reef- keeping is a complex and daunting undertaking, yet success lies in understanding a relatively few principles and parameters. There are many options available to the reef aquarist, and seemingly opposing approaches in husbandry can claim equal success. I have seen beautiful aquariums utilizing all of the filtration, lighting, supplementation, and maintenance regimes currently in fashion in both their purist and hybrid forms. I have also seen disastrous results utilizing the same equipment and strategies. How can this be? The answer lies in orienting the question toward a larger view of the task at hand. The greater goal is not to prove one method superior to another, but rather to understand the strengths and weaknesses of the approach you have chosen, and to achieve a balanced and stable marine environment. I have found that those who have long-term success with reef- keeping understand this basic principle, and perhaps most importantly, they develop an intuitive sense of what their captive organisms need, and “tell” them. In other words, they learn what to look for . . . and they look. Developing this proverbial wet thumb cannot be underestimated. Trends come and go, new technologies are developed, and scientific inquiry yields new data. What I have noticed over the years is that those who succeed as aquarists ride these “husbandry currents” as much as any novice. The difference is in a cultivated sense of what is right for their system, and in a knowledge of how changes in one area (new skimmer, no skimmer, etc.) may necessitate changes in another (more feeding, less feeding, etc.) If you were to talk with some of the respected authorities about their histories as reef- keepers, you would soon realize that they all have tried a variety of reef keeping strategies and continue to adapt and refine their techniques, yet none would deny that they were successful in the past. My point here is that the larger goal of keeping a living ecosystem in balance, is more important than the means by which the system is kept there. This column is dedicated to helping you realize this end. I will attempt to wade through the myriad of complicated, jargon- ridden, and oft- conflicting information, and help to highlight the basic principles- the art and science- of reef- keeping. I endeavor to address all the equipment and husbandry options available to the amateur reef aquarist intent on creating a thriving marine ecosystem. In time, I will address all the major issues of concern to the beginning and advanced aquarist alike: methods of filtration, lighting and feeding options, water quality, maintenance regimes, and organism compatibility, to name a few. I will rely on my own experience, the anecdotal evidence of the many aquarists that I know, and the expert advice of the other authors of this publication. It is my hope that this column will enable those of you new to this exciting and challenging pursuit to better design sensible, sustainable reef systems, and perhaps save a few bucks, a few sea critters, and a few aspirin as well. For those of you with more experience, perhaps I can remind you of some of the basics we tend to forget while experimenting with new approaches. I would be remiss if I did not state from the very beginning that setting up a captive reef system should not be undertaken lightly. This is a relatively expensive and time- consuming endeavor. Ultimately, we must admit that our reef- keeping decisions affect the lives of other living creatures. This is where our hobby differs from others. While we strive for efficient, low maintenance, self- sustaining marine systems, novices should understand that a casual relationship with your reef is not realistic. Living marine creatures cannot be put into boxes on shelves like stamps or coins, or housed in a garage like antique cars to be played with on weekends. Reef systems need near- daily attention, and like gardening, it gets dirty and frustrating at times. We all lose organisms and experience system crises. Even the “experts” whose opinions we rely upon so much readily admit to knowing relatively little of the complex relationships and biochemical processes at work in our captive systems. If I have dissuaded some of you from taking the leap into the often turbid waters of reef keeping it is probably for the best. However, armed with accurate information and a sincere commitment to succeed, the world of reef aquariums can yield tremendous rewards in terms of beauty, wonder and appreciation of the stunning complexity of undersea life. For those of you who are still game … let’s begin. By now you have realized the need for information. The first advice I give to novice aquarists is to read, read, read. The more information you have at your disposal, the more informed your decision making will be. 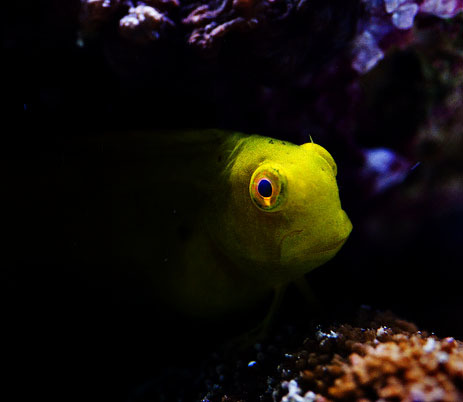 This month, I’d like to recommend some resources for getting a solid grounding in the various philosophies, techniques, technologies, and terminology commonly encountered in the reef aquarium literature. Books There are several great reef books available… and some less- than -great ones too. A thorough comparative review is beyond the scope of this column, so I will simply recommend a few of particular interest to the needs of beginners. John Tullock’s book, Natural Reef Aquariums seems to me a good place to begin. It covers all the options available to amateur aquarists, and gives reasonable, clear explanations of the various biological and chemical processes at work. As always, John gives ample play to ecological and ethical issues that the novice should pause to consider. While I don’t personally practice the type of regionally specific reef keeping John details, I certainly have no problem with it. One can learn a lot from understanding how organisms that are typically found together in specific geographic locations interact, and what specific conditions they choose for themselves. I prefer to adopt a coral gardener’s position… mixing and matching for aesthetics, while making sure the specific needs of my various organisms are adequately provided for. The Reef Aquarium Vol. 1 by Julian Sprung and Charles Delbeek is a must have for anyone thinking of setting up a captive reef system. It details the ecology, biology, and husbandry of a wide range of corals and invertebrates. Good photos of specific species will help the beginner identify and choose organisms appropriate for their systems. Volume 2 is also excellent, but does not contain the same information on setting up a reef system as Volume 1. The Modern Coral Reef Aquarium by Alf J. Nilsen and Svein Fossa is also a must have, but is pitched at a slightly more advanced level. Perhaps not the book to start with, but you’ll want to own it eventually. Web Resources There are also a number of great reef aquarium sites on the world wide web. Certainly this publication is one of them. For the beginner, I would suggest reading the many FAQ (frequently asked questions) sections found on a number of sites. There are also many bulletin boards were you can post questions, and receive answers from a wide range of people. I should caution you that the information you will receive on these boards varies tremendously in terms of accuracy, but if you frequent a site often enough, you can begin to figure out who is giving sound advice, and who is not. There are also numerous web sites maintained by fellow aquarists which often contain pictures of their systems, and equipment and husbandry information. Now that we have discussed some basic principles and larger philosophical questions relevant to the beginning reef keeper. Let’s take a look at other important questions you must answer as you begin to plan a sensible and efficient reef system.Planning I cannot overstate the importance of planning. 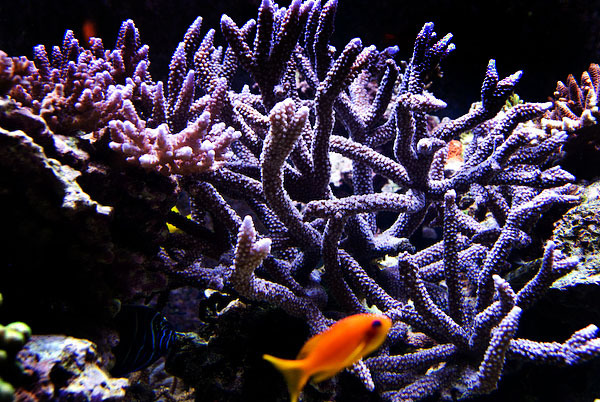 Without a well- thought- out approach to building and maintaining your reef system, you are creating a scenario that will undoubtedly lead to trouble. It is fair to say that the most common mistake beginners make is to rush ahead too quickly without thinking things through. What things? Let’s take a closer look. 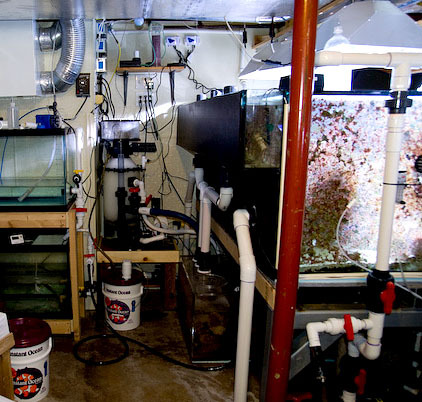 A look behind Dr. Sanjay Joshi’s 500 gallon reef tank reveals a well planned fish room. Leather/Soft CoralsThese corals are often quite hardy and most make good choices for the beginner. Included are the many species of Sarcophyton, Sinularia, Nepthea, Xenia, and Cladiella, as well as the sea whip and fan Gorgonians.. General requirements include moderately strong lighting and modest current. As with all reef organisms, good water quality is essential, but less so for these species. Drawbacks include a sometimes too-rapid growth that can shade and infringe upon neighboring organisms, and a tendency to secrete a variety of toxins-literally chemical warfare-that may bother other tank inhabitants. Mushrooms And Encrusting PolypsThis grouping of organisms contains the most readily encountered species in the aquarium trade. Most members are ideal for beginners as they are almost all hardy, colorful and relatively undemanding. They generally do well under a variety of lighting conditions, often thriving in lower light situations. As for water quality, within the broad required parameters, they are not particularly fussy. Species include members of the Actinodiscus, Ricordea, and Discosoma family in the mushroom category, and Zoanthus and Palythoa representing the encrusting polyps. If happy, most of these organisms will grow like weeds and quickly dominate a tank. This is a happy situation if you have a tank you intend to be dominated by these types of organisms, and such tanks can be incredibly beautiful. The downside is that most of these organisms are rough on more delicate species of corals and can inhibit your success with some of the species listed below. 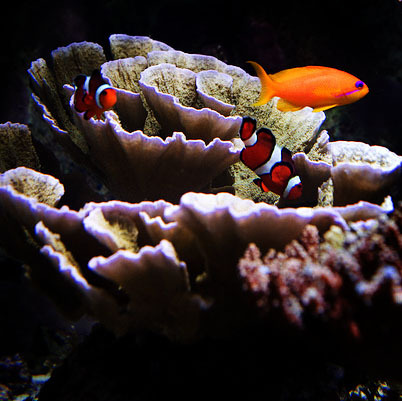 In general, they pair well with the leather and soft corals, but not as well with the majority of stony coral species. Large Polyped Stony Corals (LPS)As the generic grouping implies, these corals secrete calcium-based skeletons that house either solitary individual organisms (single polyps) or colonies of polyps that are fewer in number and larger in size than small polyped stony corals. Commonly encountered species include the brain corals of the family Favidae, and the various species of Euphyllia, Plerogyra, Caulastrea, and Fungia, to name a few. It is very hard to generalize about these organisms, as their husbandry requirements may vary drastically. Of relevance to our current discussion is the tendency of these types of corals to require a good deal of space to accommodate their propensity for warfare. 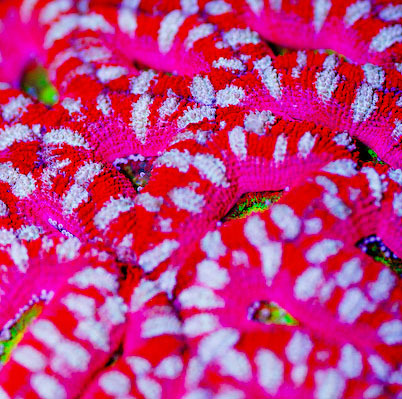 Most of these corals are capable of producing and using sweeper tentacles to deliver nasty stings to nearby neighbors. They too can be stung by other corals, and figuring out which species will tolerate each other is a bit of a learning process. 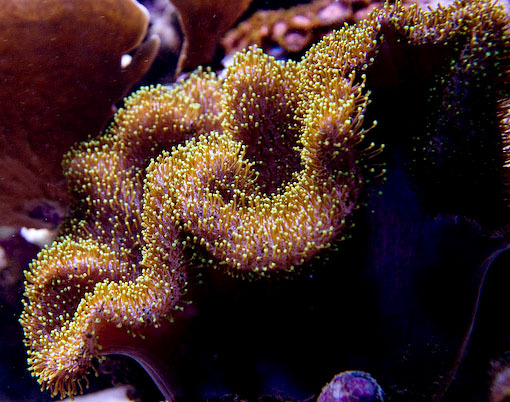 In general, LPS corals can be kept with corals from the leather/soft categories without much trouble. The water, lighting, and other requirements are reasonably similar and beautiful displays can be created by combining members of these two groups of organisms. Mushroom corals, and to a lesser degree encrusting polyps, are more problematic, as most LPS corals are very sensitive to the toxins released by these organisms. Damage is usually the result of direct, physical contact, and not poisoning via the water. The latter is however possible, particularly from leather and soft coral species. 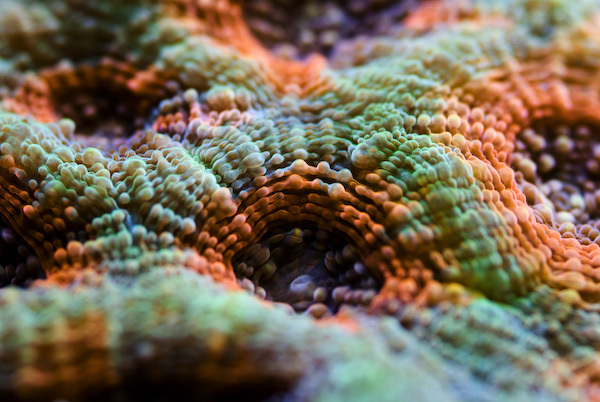 If you plan on mixing corals from the Leather, Mushroom, and LPS categories, you need to give some thought to how you are going to remove these toxins from the aquarium water. Small Polyped Stony Corals (SPS)/Giant Clams For the sake of brevity, I’ve combined these two disparate types of invertebrates, as they are often kept together and need very similar care. Neither group is recommended for the beginner, but many hobbyists, once their systems have stabilized, desire to try these more demanding yet beautiful organisms. If you have your heart set on keeping some of these magnificent animals, you should consider from the beginning the increased lighting, filtration, and water movement they require. SPS corals include the various branched and plating Acropora, Montipora, and Porites species, as well as hundreds of other corals that secrete calcium-based skeletons and house large numbers of small colonial polyps. All of these require pristine water conditions and vigorous water movement, and most require intense illumination. 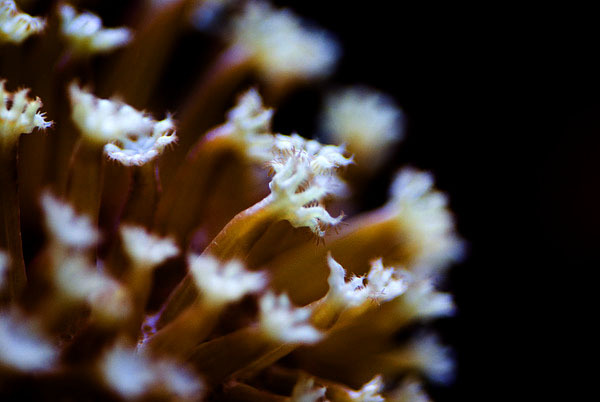 When happy, these corals can grow rapidly and are easily propagated, but they are often very sensitive to environmental fluctuations and subject to rapid crashes. Most of these corals are very sensitive to the stings and toxins of the other types of organisms discussed. Again, I do not recommend these animals to beginners, but if you have an eye toward them in the future, you need to think about it now. FishFish are the reason many, if not most, of us get involved with marine aquaria, and I can’t imagine a natural-looking reef display completely devoid of fish, but in the closed reef systems we create, the waste produced by the piscine inhabitants is of considerable concern. You need to carefully consider what kinds of fish you want to keep and how many of them your system can handle. Fewer fish means less stress on the filtration capabilities of your system. A greater number requires more efficient filtration. Which corals you have chosen to keep is also relevant here, because of their own water quality needs, and the feeding habits of the fish species you choose. Some fish are herbivores and of little threat to your invertebrates; others eat coral polyps and are not suitable at all. Still others fall somewhere in between-model citizens with certain organisms, predators on others. If you plan on keeping a dense fish population, you must plan for it. Don’t think you can get away without feeding your fish. My purpose in describing the above organisms and their very general requirements is less to provide you with precise husbandry information, than to get you to ask yourself some important questions and think through the choices you make thoroughly. It is not likely that you will know beforehand all the organisms you will keep, but thinking through the options and designing a sensible system with an eye toward the various needs of the creatures you are likely to choose will go a long way in heading off problems before they occur. I encourage you to think through the questions I have posed above and continue to read and research in an attempt to answer them.